Nobody puts Paul Smith in a corner! Aren’t there some names missing from this list? Now, uninformed county council members, let Mr. Smith give you a history of this building. (The capitalization and moniker “Young Board” is all C. Paul Smith, not us). …this building had been used by the County government by its Citizens Services Division for many years. The division director’s office was there, as was the Child Advocacy Center, the Human Relations Commission and a Head Start classroom. The Young Board of Commissioners was able to reduce the size of County Government by approximately 500 employees. 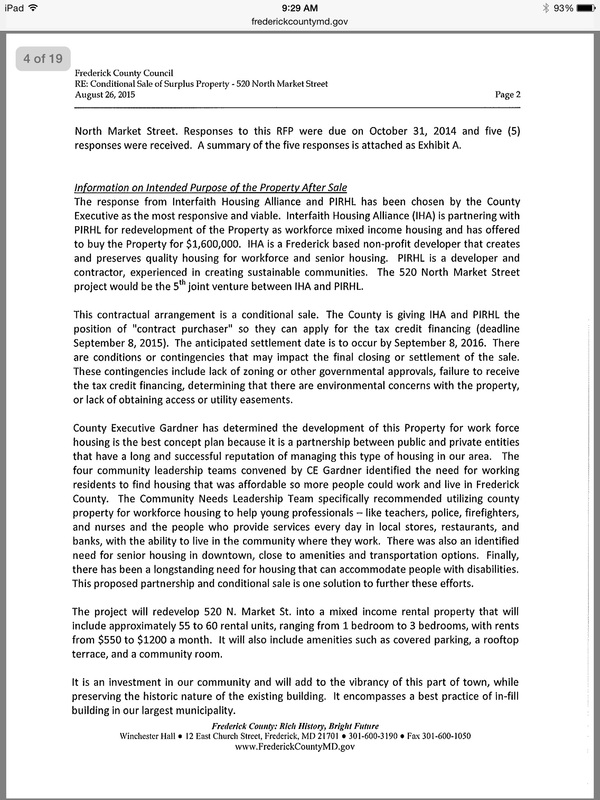 One of the results of this shrinking was to consolidate many county services into fewer buildings, making 520 North Market Street available to be sold. Ah, isn’t that sweet? We shrunk the budgets and manpower of these agencies so we could shove them all into one building. And it was the Young board that did it! So shouldn’t they get some kind of compensation? Or at least some gratitude you ingrates! Now, from what we can tell, Paul is trying to make two points with this letter. 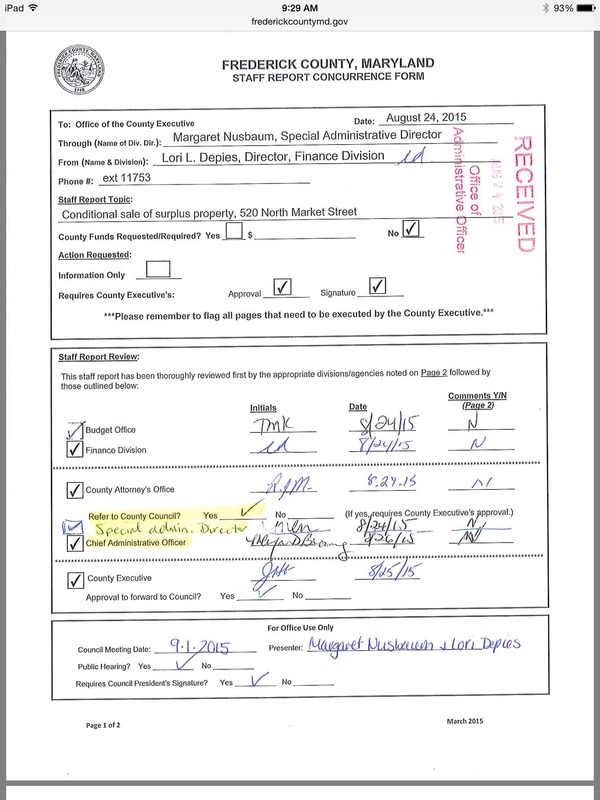 The first is that Jan, is “unilaterally” overstepping her power as County Executive in making land deals. And the second is, he doesn’t think she should be “giving” this building away. Let’s continue with the letter before we pick it apart. And finally, the startling conclusion! It should be observed that in most major corporations, the authority to sell or acquire major assets is routinely reserved for boards of directors, and are not matters of routine management that the chief executive officer has authority to do unilaterally. 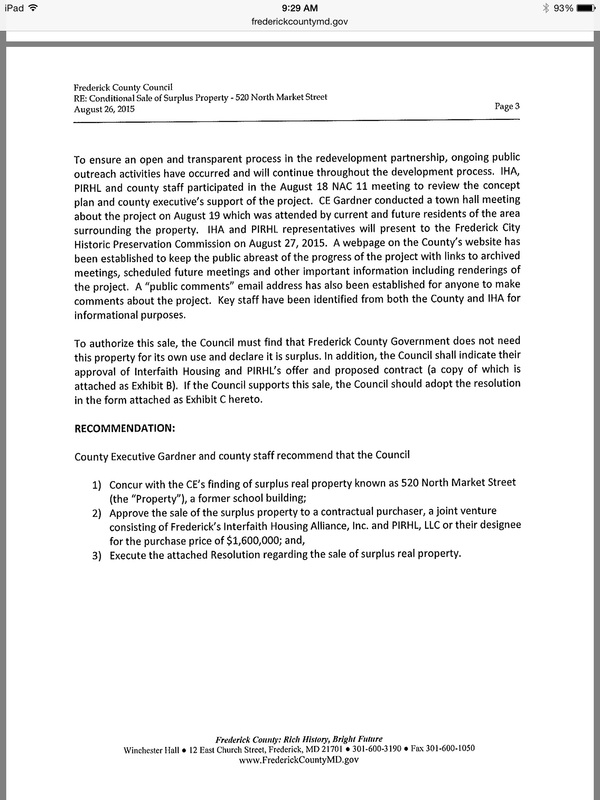 The same principle should apply in our county government-the Council should be required to confirm any such major disposition, sale or acquisition. 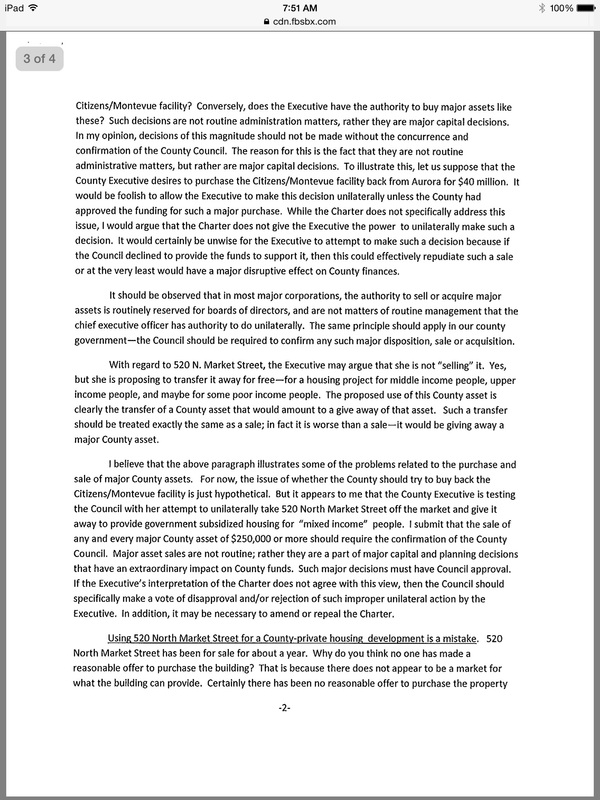 The proposed use of this County asset is clearly the transfer of a County asset that would amount to a give away of that asset. …; in fact it is worse than a sale–it would be giving away a major County asset. 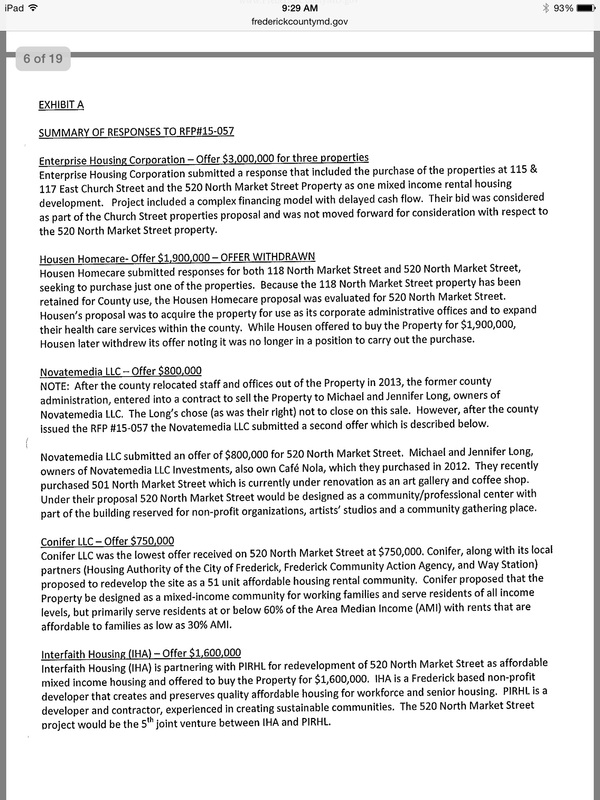 Why do you think no one has made a reasonable offer to purchase the building? That is because there does not appear to be a market for what the building can provide. This building is not compatible for normal housing. It would be difficult for a developer to make this building into a profitable housing project. 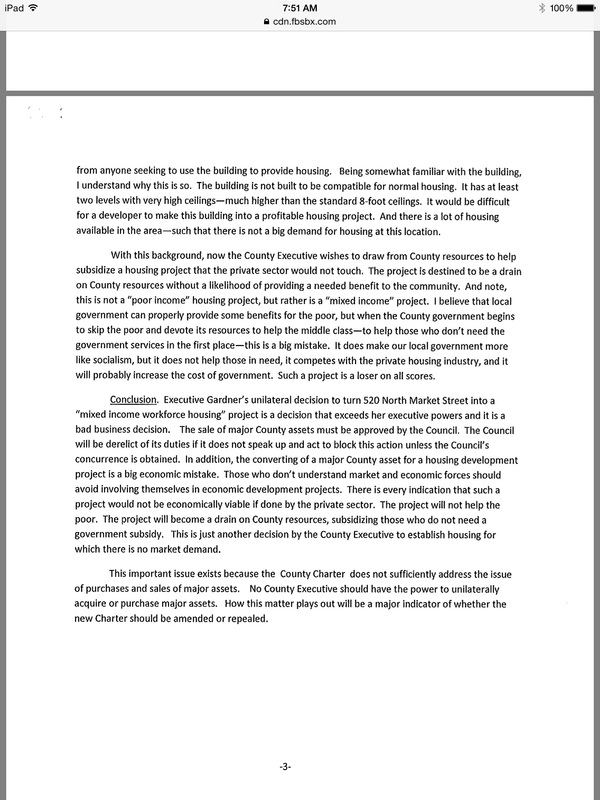 With this background, now the County Executive wishes to draw from County resources to help subsidize a housing project that the private sector would not touch. 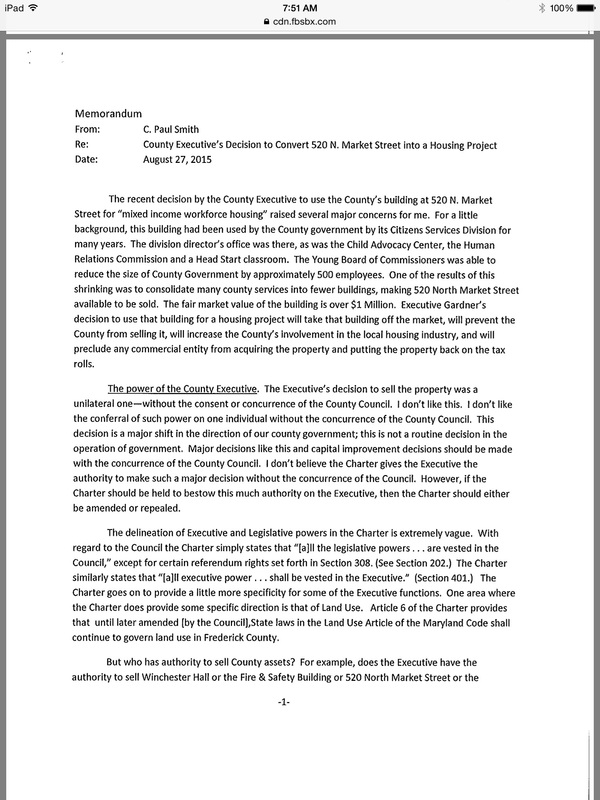 Executive Gardner’s unilateral decision to turn 520 North Market Street into a “mixed income workforce housing” project is a decision that exceeds her executive powers and it is a bad business decision. Those who don’t understand market and economic forces should avoid involving themselves in economic development projects. That’s right, County Executive Gardner! The only things you understand are diapers, dinner and keeping my suits clean! Don’t involve your delicate little mind in these man decisions! But wait. Could it be, perhaps, that everything is this letter is untrue? Could that be possible? Hmm, August 24, 2015. Before Paul wrote his letter. And what’s that check mark? Oh yeah, refer to the county council. What’s this? 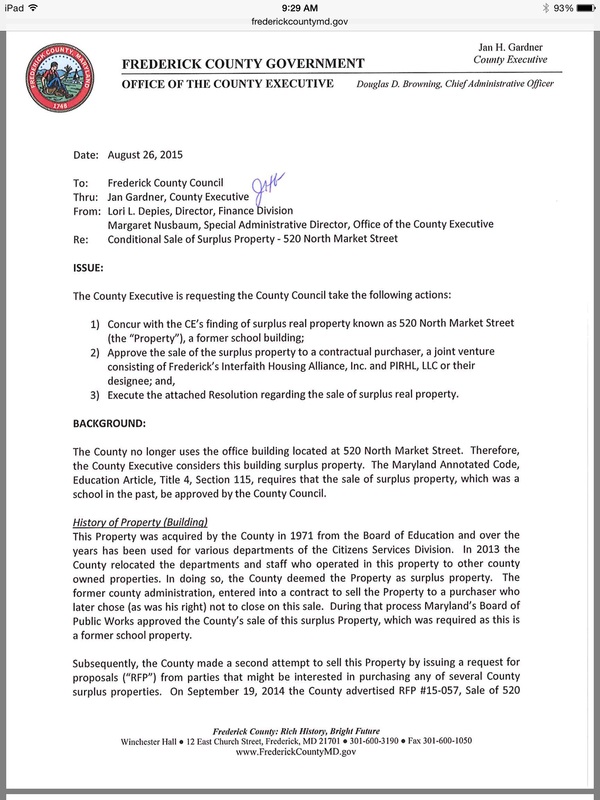 Maryland law already states that the county council must approve the sale of surplus property? I thought that this was a unilateral move. And why doesn’t he know the law? Wait?! $1,600,000? But Paul said it was worth $1,000,000. Return the money immediately! You people don’t understand market and economic forces! Ah, an open and transparent process. And a joint venture between whom? I don’t see Frederick County on that list. I don’t understand. Paul said there were no reasonable bids. What’s all this then?! As far as we can tell, unless our female brains are failing us, every single issue addressed in this letter is wrong. It’s as though he had no knowledge at all as to what was happening with this property. None! And we do remember listening to a very recent county council meeting about this very issue. Therefore, Jan did not act unilaterally, numerous people wanted the property, bought it for more than what he claims it was worth, and is there one single valid point in this whole thing?! We can’t figure out why he wrote this letter. If his intent was to embarrass Jan it certainly backfired. 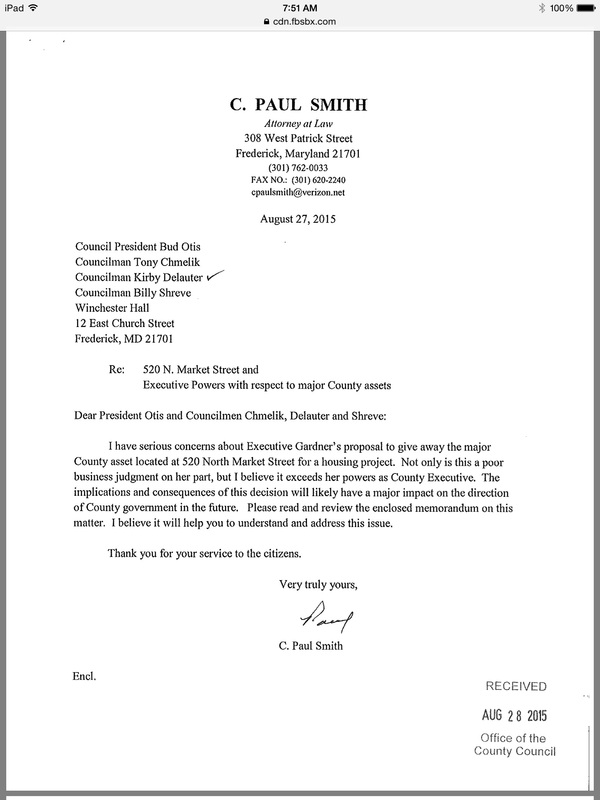 The only person that should be embarrassed by this letter is C. Paul Smith, Attorney at Law. Therefore, Mr. Smith, we are going to have to ask that you leave government to those who actually understand what they are doing. Thank you very much. 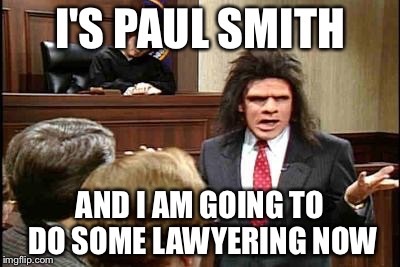 If you are feeling that Paul Smith is basically telling us women folk to sit-down and shut-up and let the men folk do all the governing and thinking and stuff, it could be because he is a Mormon and if you know anything about how that religion represses women you will understand why you get that feeling from Paul Smith because that is exactly what he is trying to do, tell us women folk to sit-down an shut-up and women should be seen and not heard and can only speak when spoken to.